Tony's bio from Creative Jazz Club... "Drummer Tony Hopkins is no stranger to Auckland audiences.. 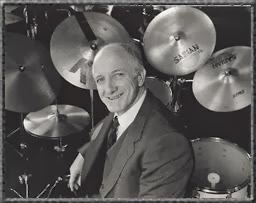 He started his full time career in 1958 as Johnny Devlin’s drummer, backed several famous American pop singers and was a regular at the iconic Montmartre Jazz club in Auckland in the 50’s. He was music co-ordinator at the influential “London Bar” in the from 1990 to ‘94, giving valuable support to kiwi musicians Nathan Haines, Tim Hopkins, Matt Penman, Matt Field, Kevin Fields ." Chris Bourke notes that Bruce Morley (another fine local drummer, who sadly passed away in November 2012) "... wrote a piece in 1963 called ‘Drums By Four’, played by a quartet that also featured other leading local drummers Don Branch, Tony Hopkins and Allan Nash... [also in 1963] he [Morley] interviewed most of New Zealand’s top drummers for a monograph on the craft in New Zealand. All answered the same set of questions, and typically they came from a wide variety of music styles. Among those interviewed were Don Branch, Ted Croad, Eddie Croad, Lachie Jamieson, Tony Hopkins, Bruce King and Billy Nuku." Tony won a NZ Music Award in 1993, for best jazz album, for Broadhurst / Hopkins / Haines - Live At The London Bar. He also played 'jazzy rides'on Nathan Haines' debut album Shift Left, which won best jazz album at the NZ Music Awards in 1996. She writes of her channel: "About Tony Hopkins (not Hannibal the cannibal but a drummer). It is very enjoyable to organize these clips, most of them with Tony (my husband) playing Jazz, Rock,etc. in New Zealand and in concerts in Brazil. Check out his energy!" ADDED: Chris Bourke has posted part of an interview he did with Tony in 2001 for Musical Chairs on Radio NZ... well worth a read. excerpt: Tony Hopkins: "I left him [Devlin] after we went to Australia. I was becoming sick of the music and I was getting interested in jazz. I was living in a flat in Kings Cross, a place called Waratah House which was up the top of King’s Cross. There was about five of us guys living there, one of them was Mike Nock. I’ve known Mike since I was 17, we used to share a flat in St Georges Bay Rd in Parnell when we were 17, we’re both the same age. I started to get disenchanted with rock’n’roll in about 1959, when I was sharing this flat with Mike Nock in Kings Cross. Mike used to play for Devlin in the very early years, not much, he played just a few gigs with him and we used to play together from time to time at the Montmartre in Lorne St – the building’s still there by the library, behind the St James – anyway, in this flat in Kings Cross, the boys were all into bebop and modern jazz and I started listening to it, and started to play it. So I became a little sick of the simplicity of rock’n’roll. I like the freedom to create that’s in jazz that isn’t so much in rock’n’roll..."
ADDED: Published in The New Zealand Herald on January 12, 2013: "HOPKINS, Anthony Leonard. Passed away at 1.18am on January 4th, 2013 after a short battle with cancer. He was cared for by his family and surrounded by them when he died. Tony The Big Boppa Hopkins, known for his impeccable timing and swing, was a legend in the NZ music scene. An accomplished and inspired musician, his contribution to both Christian and secular music will live on in our hearts and lives. He leaves behind four adult children, who invite you to join them in celebrating his life at a Memorial Service at 11am, Saturday 12th January at St Paul's Church, Auckland City and afterward from 1pm at his family's home in Ellerslie. Our Dad touched and inspired the lives of many with his brave and fiery spirit, and we thank him." 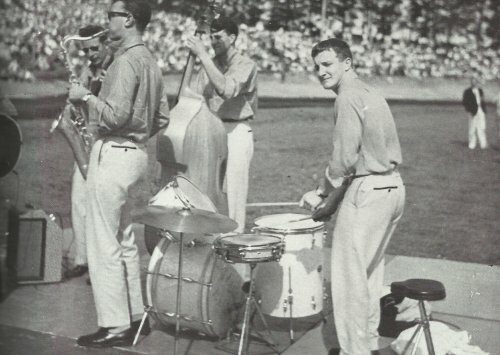 John Dix writes Tony was "One of the great NZ drummers and all-round good guys .... Tony's career was nothing if not eclectic - in the late 1950s he was in NZ's first great rock'n'roll band, Johnny Devlin's Devils, and in the 1960s his jazz workshops provided inspiration and a forum for many Auckland musos. In the 1990s Tony and saxophonist son Tim regularly entertained the cliquey set at Cause Celebre and more recently Tony has been playing with guitar ace Doug Jerebine. At home playing rock, jazz or hip hop, NZ's "oldest teenager" was one of a kind. 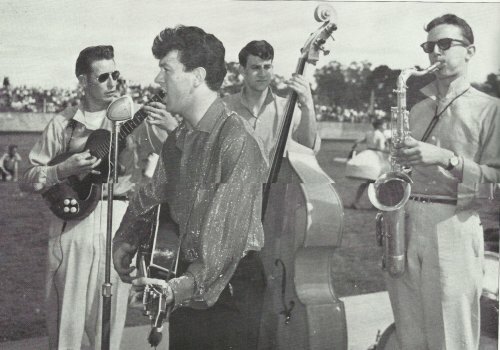 Hei maumaharatanga ki te tino hoa..."
ADDED: I scanned two photos of Johnny Devlin and his Devils (featuring Tony on drums) at Western Springs, 1959, from the book Stranded In Paradise, by John Dix, who says these shows at Western Springs attracted over 10,000 people. Photos credited as sourced from Phil Warren. 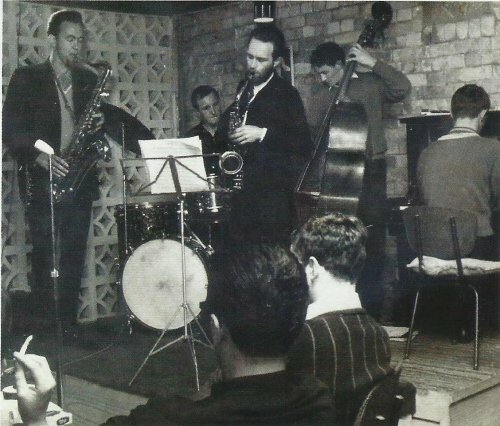 ADDED: Found this photo blow in a Metro article on Doug Jerebine/Bob Gillett (Dec 2011)... caption says this is The Jazz Workshop at the Bali Hai, off High St (band later became The Embers), October 1962: Brain Smith, tenor sax; Tony Hopkins, drums; Bob Gillett, alto sax; Neville Whitehead, bass; Mike Walker, piano. ADDED: One of Tony's last live performances, posted on youtube by his daughter Kathryn. There's another video she's posted (also below), of "Tony Hopkins being presented the Scroll of Honor music award by his son Tim Hopkins in Auckland, New Zealand on Sunday 28th October, 2012. Awarded for over 50 years contribution to the New Zealand music industry, his mentoring and charity work. We salute you Tony. "What is special about this award, is that Dad has recently been diagnosed with Pancreatic cancer, that has already spread to his liver and that it is inoperable. The specialist has given him 12 months. This award of recognition and validation for all of his years dedicated to playing and sharing music is such a wonderful way of giving something back to him. It has meant a lot to him, as his so many people coming forward with their positive thoughts, prayers and words. Thanks to everyone for that. We love you Dad. Thanks to the Variety Artists Club for the award." What sad news, I met tony thru a shred love of music at the london bar on monday nights when all my old band mates would meet up for beer and some chill tunes from tony and varying band members... then seeing him at Deshlers .... Now looking back I do remember him playing at celebrate, i think with Nathan Haines and maybe someone from freebase? man the memories hazy but he was such a cool cat.. such style in his playing and such a really genuine lovely approachable human being that loved sharing his love of music with everyone.. even us tattooed freaks who followed him..
R.I.P Tony. your a nz icon! Hi, thanks for writing this, Dad was a very special guy and one of only a handful of musicians in NZ that reached icon status. Thanks to all the many who attended the memorial and wake, especially Roger Manins for his support, love and care, truly a brother. Kia kaha.